On tour with their debut self-titled release from Virgin Records, SAVING ABEL is looking to give crowds a “straight up rock show,” according to bass player Eric Taylor. The band has been playing since 2004 and are currently touring with AVENGED SEVENFOLD, BUCKCHERRY, and SHINEDOWN. Southern grown rock, with a whole mess of other influences from the ALLMAN BROTHERS to LYNYRD SKYNYRD to 3 DOORS DOWN, Taylor says the band is ready to show the world what they are made of. 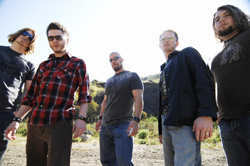 Though their singles “Addicted” and “18 Days” have pushed SAVING ABEL to stardom quickly, the band remains very humble and fan-oriented. When asked what the band does with their down time, Taylor simply answers, “party,” but as he explains, all their partying is done with their fans. They make an effort to get out and truly meet, hang and party with their fans. That is what really separates the band from other musicians in the mainstream. Taylor explains that the best part of touring is seeing a crowd of thousands, and then hitting the bars with as many of them as possible; meeting and getting drunk with new friends everywhere they go.